I wasn’t quite sure what to expect as I approached Christ Church. 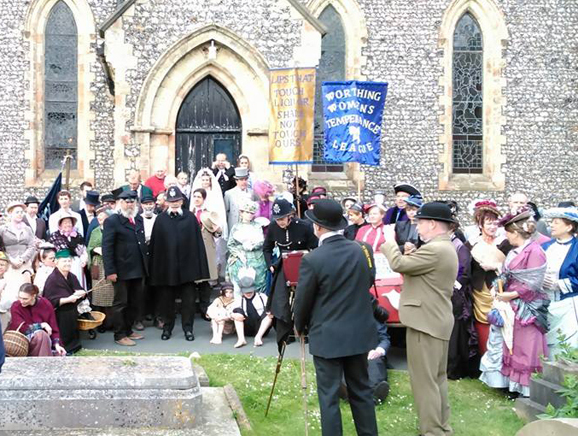 This impressive, neo-Gothic flint church, built in 1843 in the heart of Worthing, was the perfect setting for The Just Cause, Worthing’s Community Play and a retelling of the turbulent times of 1883-84. As I neared the gate the sound of singing reached my ears. Looking across the churchyard I saw a group of people in costume raising their voices to the sound of a stridently stuck tambourine. The Salvation Army. The fun had started. More folks in costume milled around at the door of the church, which was attended by two imposing gentlemen dressed as 19th century police officers. I joined the lengthy queue. Inching forward, enjoying the warm sun and idly studying the amazing flint walls of the church, I was suddenly distracted by two little girls who came up to me looking very wretched. One said, “have you got anything to eat?” I said, “no I’m afraid not” before I twigged, then hastily changed tack with a brusque, “be off with you”! 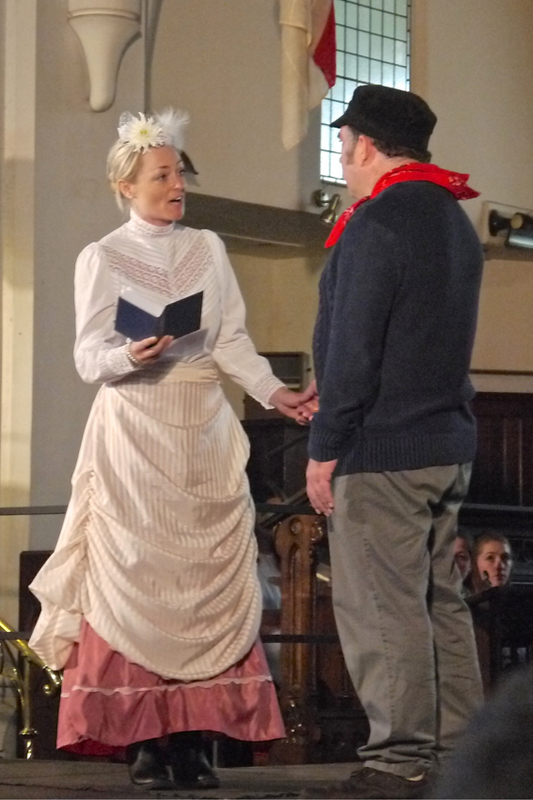 It seems even the audience had to be in character! In no time we were inside, the cool interior a welcome respite from the humid afternoon. Although the church was filling up fast I was able to find a seat near the front. I settled down and looked around me. Many of the audience were in costume. 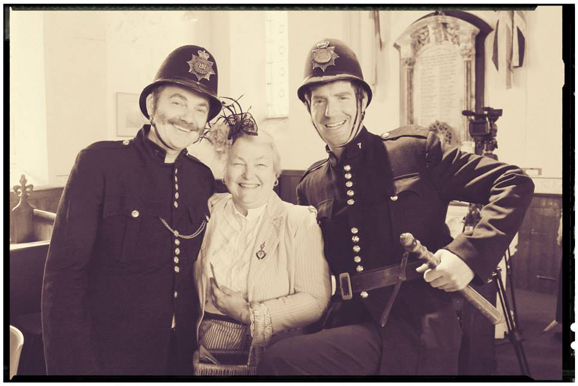 In front of me were a couple of lads in Salvation Army uniform, many of the male faces were bewhiskered, and the hats… it was like a milliners’ convention. In her introduction to the play, writer and director Ann Feloy writes, ‘The congregation is sitting according to class, as they would have in Victorian times – the upper class and gentry at the very front, the middle classes behind and working class behind them. The rougher elements of society and the fishing community are up in the gallery, perhaps where they are less likely to be smelt.’ And so it was; and as the plot unfolded members of the cast appeared from their allocated pews and joined in the action. The culmination of a colossal two year project, The Just Cause, a Victorian Romance & Rollicking Good Riot, is a tale of shipwrecks, social unrest and romance. 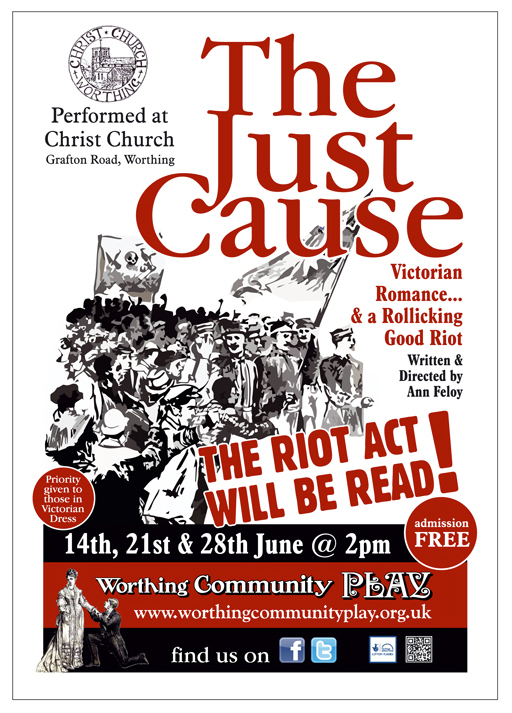 The plot is woven around past key events from Worthing’s history – the wreck of the Teresa, the growth of the Temperance Movement – and features actual characters from the time. With a large cast of speaking parts and even bigger supporting cast, the work needed to put together a production of this kind, from the initial research, to set and prop design and costume making, song and line- learning and of course rehearsal, was enormous. Galvanising the community was the solution, and of course the raison d’être of the whole project. People came from all corners of the town with the skills needed to move it forward, and many more involved found they had skills previously undiscovered! The cast comprised actors of all ages, “The range of experience surprised and delighted us,” says Feloy. “There were some professional actors and others with years of amateur dramatics experience, but the majority of people had done very little acting, despite showing incredible talent.” All threw themselves into the experience with commitment and gusto. The result was a triumph! With audience participation reminiscent of music hall – ah, the songs… one of my favourite moments was the rabble singing “Give the old bugger a drink” – it was engaging, humorous, topical, even a tad satirical – the MP Sir Robert Loder, played by historian and the play’s project manager Chris Hare, in cahoots with the Worthing Gazette proprietor, played by the current incumbent of the Worthing Journal Paul Holden, has a familiar ring. There was a brilliant reconstruction of the storm that wrecked the Teresa, the Riot Act was read… all in all it was thoroughly enjoyable. I walked out into the afternoon sunshine light of heart, with a warm glow and broad smile, feeling that through the time machine of the Community Play I’d had a peek into the past and as a result felt closer to my newly adopted home town. Read more and see photos & snippets at www.worthingcommunityplay.org.uk & www.facebook.com/Worthingcommunityplay and http://vimeo.com/99469060.